The Pharaohs Rally of thirty years was won by Joan Barreda, who thus enters the exclusive club of champions of the Great Rallyes. The young Spaniard, 29, (was born in Torreblanca), Castellon, leads to success for the first time the brand that runs, Husqvarna, and the team that launched him, Speedbrain. Barreda won three of the six stages played and was in the lead from the first to the last day of the race, finishing with a lead of almost twenty minutes on the Polish Jakub Prygonski. 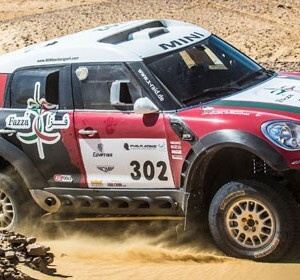 In third place Jordi Viladoms, who, with the victory at the Sardegna Rally Race and the podium in Cairo is vice-champion of the World Cross-Country Rally for 2012. The Catalan of the Bordone-Ferrari Racing Team has won the second stage of the rally, and was forced to slow down during the next for the failure of its engine. In the same stage, trying to recover, Viladoms fell suffering a badly bruised chest, but this did not prevent him from continuing to run in pursuit of a result and in defense of the world rankings gained after an excellent season. In the most delicate moment of the race, with low morale and severe pain in the cracked ribs, Viladoms fielded the character of the fighter, succeeding in the final two fractions to straighten a result that seemed hopelessly compromised. Upon arrival on the esplanade in front of the Giza pyramids, Viladoms found waiting for him Alessandro Botturi, that flew to Egypt to celebrate yet another excellent result obtained by the Rider and his Team. Joan Barreda makes history for Husqvarna.